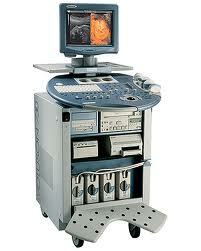 The GE Voluson 730 Pro ultrasound has been hailed as one of the best-selling 4D ultrasound systems of all time. Offering high-quality 2D, 3D, and 4D imaging, this cart-based ultrasound system has a 3D Surface Rendering feature for more detailed fetal and organ display. Furthermore, this ultrasound’s imaging technology is powered through its several imaging modes, including M-Mode, PW Doppler, CW Doppler, Power Doppler and Color Doppler.Physicians can view images on the machine’s 15″ high-resolution monitor and 10.4″ LCD touch screen. Physicians can also take advantage of its streamlined image acquisition process as well as its ability to connect to a large TV for viewing. The GE Voluson 730 Pro is a go-to system for people looking for a good price and excellent image quality for a 4D ultrasound machine. These used ultrasounds are very stable and have a very long life. We have customers who have owned them for 10 years and still love their Voluson 730 Pro.